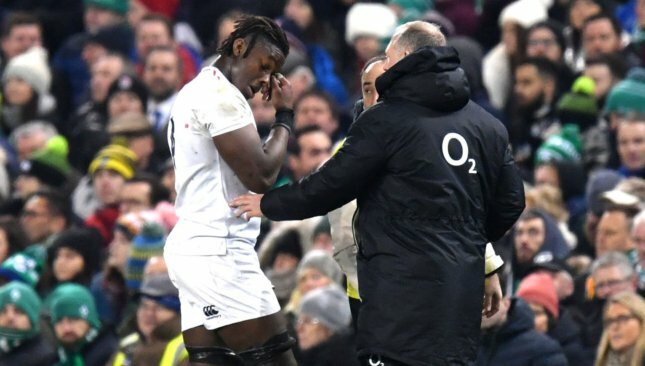 England hope that Maro Itoje will return in time to reinforce the final stage of their Six Nations title pursuit after being struck down by a knee injury. Itoje will miss the clashes with France and Wales due to a grade two medial ligament tear sustained in the second half of Saturday’s remarkable victory over Ireland at the Aviva Stadium. But if his rehabilitation progresses well, the British & Irish Lions lock could be back for the last two rounds against Italy and Scotland. Offsetting the news of his absence is the return to fitness of flanker Brad Shields, centre Ben Te’o and wing Joe Cokanasiga, who missed the stunning start to the championship in Dublin through injury. “Maro had the scan and saw a specialist yesterday (Monday). It’s ligament damage to his knee,” forwards coach Steve Borthwick said. “We anticipate him being able to play at the latter part of the tournament. Hopefully he’ll heal fast and we’ll have him back ASAP. 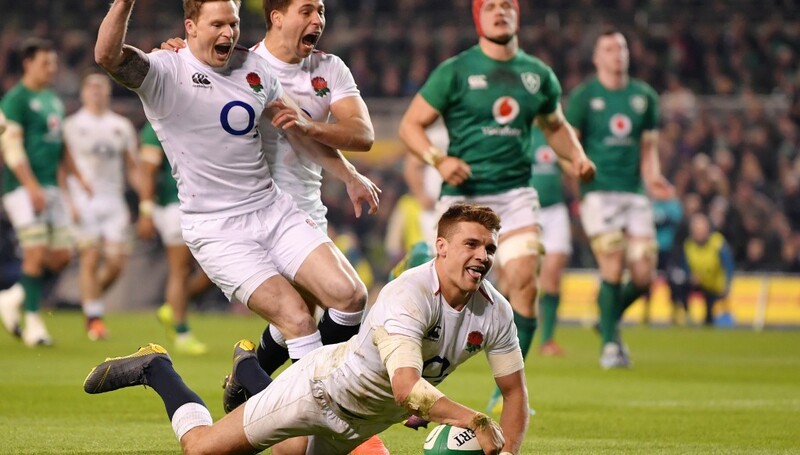 England cruised to victory in Dublin. As cover, Itoje’s Saracens team-mate Nick Isiekwe has been called into England’s 35-man training squad that has assembled to begin preparations for Sunday’s visit of France to Twickenham. Courtney Lawes, who was a second-half replacement against Ireland, and Joe Launchbury are competing to fill the vacancy in the second row alongside George Kruis. Itoje will remain at the squad’s Surrey training base to continue his rehabilitation and in the meantime England must decide how to cover for the loss of a player who Eddie Jones believes will soon be recognised as the best lock in the world. “Maro’s a fantastic player and a great personality around the squad. Clearly it’s significant that he’s out, but we have a lot of brilliant players in his position,” Borthwick said. “You’ll always miss a player of his calibre, you’ll take some strength out of your team, but we have very good and experienced players to come in. “It was a tough decision to leave Joe out against Ireland and he was brilliant in the way he supported the team, which is great credit to him. “We all saw the impact Lawes had off the bench, the hitting power he has and how he can carry. Itoje sustained the injury to his right knee in the second half of England’s remarkable win at the Aviva Stadium when being cleared out of a ruck by Ireland flanker Peter O’Mahony. He was ruled out for five weeks after suffering a chipped patella to the same knee in the build-up to the autumn series, playing throughout November until the nature of the injury was discovered. 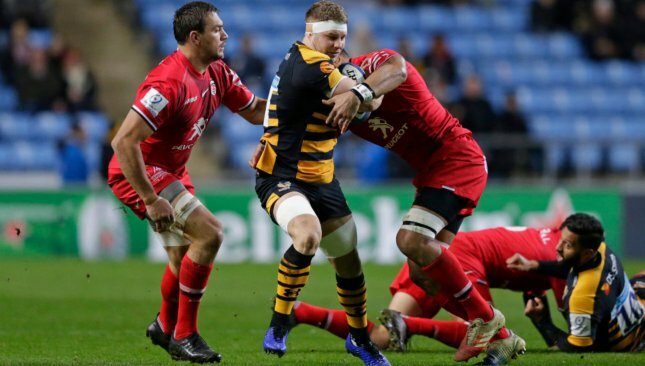 Thomas Young is shining in the Premiership with Wasps this season. Thomas Young looks set to make his Six Nations debut for Wales in Saturday’s clash against Italy. The 26-year-old Wasps flanker, whose two previous caps were gained on tour against Tonga and Samoa in 2017, could make Wales’ matchday 23 following last week’s fightback victory over France. Wales have a 31-man playing group at their Nice training base, and the likes of Young and Leicester back Jonah Holmes – a Test debutant earlier this season – might be involved in Rome. The 24-19 win against France last Friday – secured after wiping out a 16-point interval deficit – was Wales’ 10th successive victory. And if they beat Italy for a 13th time on the bounce, it will equal Wales’ all-time unbeaten record of 11 Tests set between 1907 and 1910. Wales head coach Warren Gatland is due to name his team on Thursday ahead of departure for Rome. Young, son of Wasps rugby director and former Wales prop Dai Young, has been among the Premiership’s strongest performers this season. And the Stadio Olimpico encounter is likely to offer him an opportunity of leaving an impression early in World Cup year. “He has been a consistent player,” Wales assistant coach and forwards specialist Robin McBryde said. 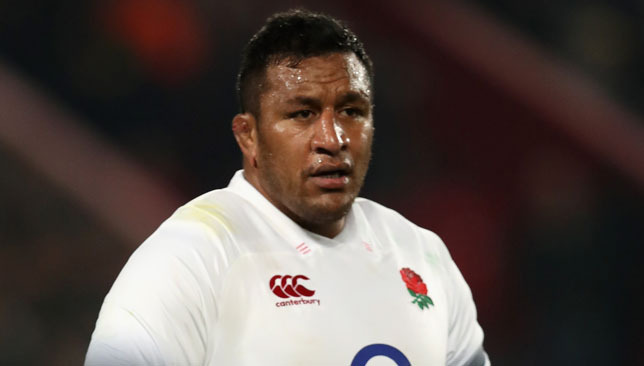 “He is a consistent performer for Wasps every week. He’s playing in a league where there are big men week-in, week-out, and the intensity is there. “He’s had several man-of-the-match awards. In defence he makes intelligent decisions of when to compete for the ball, and in attack he links up with the backs. He is doing that here as well. “Our training is a bit different to club level – the intensity and metres covered is up – but he has dealt with it. Wales again trained in glorious Cote d’Azur sunshine on Tuesday, and McBryde added: “It’s very reminiscent of Llandudno, so I feel at home. “It has been good to recuperate after a tough match last Friday night. You couldn’t ask for better surroundings. “But we have to be aware not to slip into holiday mode. We’ve got some hard work to do before Italy. “Everybody realises the importance for the first two games and the momentum it can create by getting positive results. Gatland is keeping selection cards close to his chest, but it would be no surprise to see changes being made in the starting XV and on the replacements’ bench. “Italy will be buoyed by the last 15 minutes when they came back strongly against Scotland (last Saturday),” McBryde said. England and Wales lit up the first weekend of the Six Nations with blistering wins away. 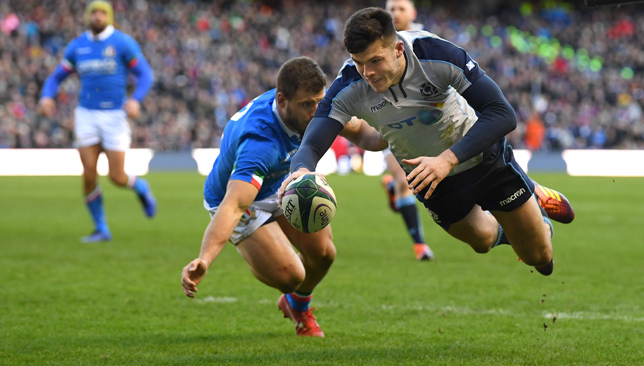 Elsewhere, Scotland survived a late barrage against Italy to secure victory at Murrayfield. Hands down the best player of the weekend. The Saracens man purred with confidence and made a staggering 27 tackles at the Aviva Stadium. For all the stars on show in the Irish capital, Vunipola shone brightest with a stellar defensive display. There was so much impact in those tackles and his hard carries also put Ireland on the back foot throughout the contest. With little game time coming into the fixture, he delivered brilliantly against Tadhg Furlong and further underlined why he is one of England’s most important players. A joy to watch. The Exeter man produced his best performance in an England shirt to date, with solid decision making on the ball and some tight defensive work at the heart of his blistering display. The 25-year-old outpaced the Ireland backs for his first try and then intercepted Johnny Sexton’s forced pass to extend the scoreboard late in the game. Slade’s ability to stretch the defence with his accurate passing and his deft kicks take the pressure of Owen Farrell and will be vital in tough fixtures that lie ahead against Wales and Scotland. The Edinburgh full-back started at No11 in the absence of the injured Sean Maitland and capped off a fine performance with a hat-trick. In fact, he became the first Scotland player to score a treble in the championship since Iwan Tukalo against Ireland in 1989. His stunning showing creates a selection headache for boss Gregor Townsend who will have Maitland to call upon when he returns from a hamstring injury next week. But judging by Kinghorn’s performance in loose and open place it will be hard to drop him, especially with his pace, game management skills, exceptional footwork and overall consistency in attack and defence. The Ospreys man produced another totemic display to halt an imposing French defence and help his side to a late victory. Tipuric showed commitment to put pressure on Camille Lopez when he attempted a snap drop goal attempt on 68 minutes. He was a menace at line-out time, denying Les Bleus’ from building any form of attacking platform. The 29-year-old finished the game with 18 tackles, but even that astonishing statistic does not do justice to the overall impact he brings to Warren Gatland’s side as well as adding serious balance to a superb back-row. France’s early flourish may be one of the few positives when Jacques Brunel and his management team review the video on Monday, but the other no doubt was the performance of Picamoles. The 32-year-old made 10 tackles and 14 carries in a virtuous display at Stade de France. He was a major part of the Les Bleus’ side as he attempted to cut down the impact of Wales’ forwards. If France can build on their first half performance against Wales then they could find that consistency needed to excel in a vital World Cup year.